Hmm I was curious if that was her hair or part of the coat now mystery’s solved, but now… Did they just teleport cause damn this is gonna be tough for Diver and Charlie. There are only so many easy-to-get aspects, after all. Nope, a memorial stone. See the comments on the previous page for the explanation. I really adore Charlie’s impressed face here. Seconding the love for impressed face, but I have to admit that its Diver’s worried eyebrows that really won me over. Sound about right. And on the precedent page you can almost see tiny juliet flags on the rifle. Also depending on the light there is more white than blue on this aspect… Maybe it is Sierra? Thought I can’t relate the flag meaning to this aspect behavior… So far Papa and November were theorised. 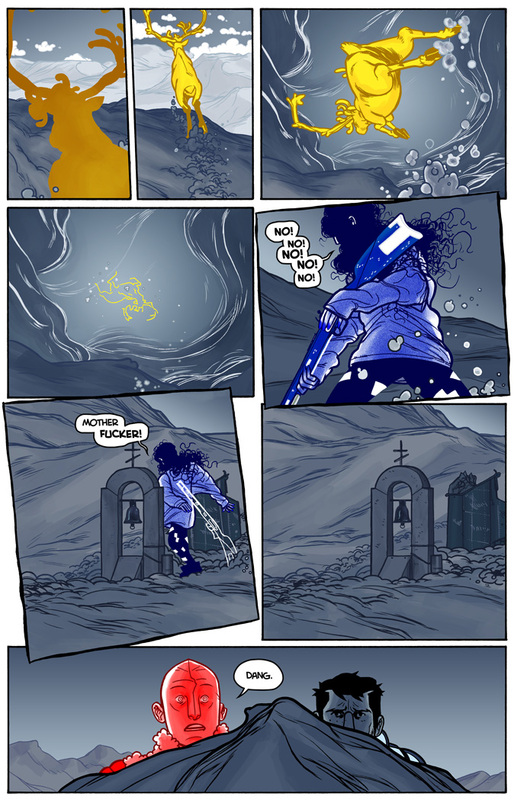 The two only remaining flag being blue and white (assuming Juliet is the gun) are Mike and Xray. Xray mean “Stop carrying out your intentions and watch for my signals.” and this aspect is indeed taking initiatives. Also maybe if Quebec is the divers healt/life force maybe it can’t die. My mistake, what I thought to be tiny juliets on the rifle was just some parts. Also… My flag is Yankee? “I am dragging my anchor.”? I know theses are random but… oh well no big deal. Actually, looking at the stock in panel five, I think you were right! HAha! She seems November to me. I agree with you regarding the gun being Juliette. Uncertain why I am Bravo. I hope my Bravo-form is a hatchet.